Happy Friday guys! From the looks of it, many of you are salad connoisseurs as you have some great recipe ideas. I'm thinking of trying them out sometime soon. ;) Today I will be posting about my daily eats, which so happens to be a "conventional" way of writing up a post in the food and fitness blog world, but not so conventional for me. These scrumptious shtuff (say that 5x) are what Greg and I ate yesterday from breakfast to dinner. To my surprise, Greg has been eating way healthier than ever before. And what's even more surprising is that fact that he enjoys everything I make, with a few exceptions like say, roasted potatoes. Say what?! Who doesn't like roasted potatoes?! Our morning's highlight was strawberry cream/cottage cheese stuffed froast (French Toast). Can you just see the deliciousness oozing out of its seams? Oh yeah, and check out that gorgeous plate that I got on our wedding registry. ;) Pretty much everything "nice" that we have is from all our loved ones, so thank you guys for the blessings! This froast is quite similar to the cottage cheese stuffed french toast that I made ages ago, except this one has strawberry slices instead of pear, cottage cheese, and tofutti, which can be replaced with real cream cheese. 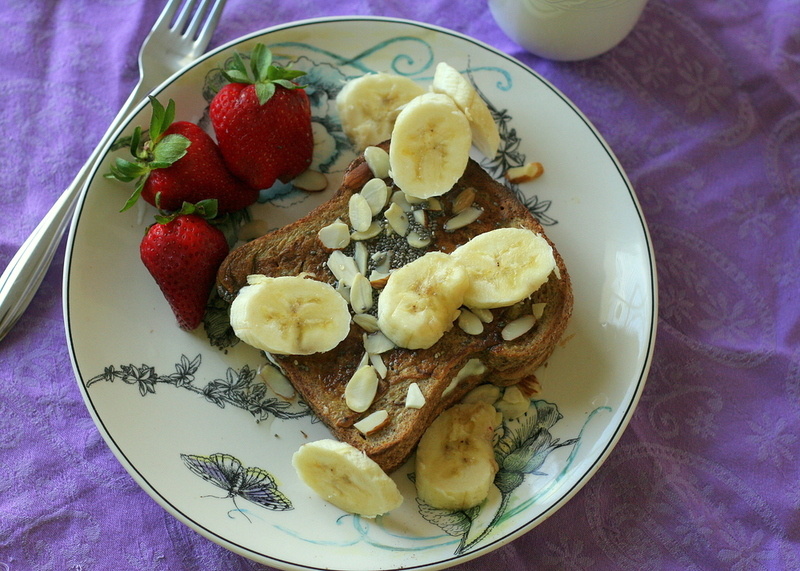 Greg was a HUGE fan of this breakfast especially topped with banana, pure maple syrup, chia seeds and almond slices. A picture of lunch was forgotten due to my hunger and impatience. Woops. But what I didn't forget to document is this awesome super sampler box that I got from Vitalicious! As soon as I found out that a box was waiting for me at the doorstep, I leaped with childlike excitement, haha. Every time I'm perusing through the isles of the store I eye the Vitatop boxes in the fridge, only to realize that it's pricier than I would like. I've always heard great things about the taste as well as the nutrition aspect, so I was really curious to try them out for myself. It's great stuff! It tastes amazing and it has loads of fiber. Greg loves it just as much as I do, especially when it's warmed up and covered in ice cream. I, on the other hand, ate some in the car on the way to seeing the kids we volunteer with. I scarfed it down with Justin's PB drizzled on every bite. :P Thank you my Vitalicious angels! Oh yeah, I also had a pear as my other snack later in the day. Dinner presented itself in the form of Korean again. We don't eat it all the time, but with the frozen meat that I had waiting for us, paired up with raging hunger after seeing the kids, we knew we'd be having a Korean banquet. The meat gets wrapped in crunchy lettuce and it's topped with [brown] rice and spicy pepper paste. Judge not. I like to mix my food in different ethnic dishes. :) I had some of the leftovers from the Indian restaurant as well. We had overnight oats that were refrigerated last night. The mix includes 1/2 scoop of protein powder, a big spoonful of greek yogurt, chia seeds, mashed banana, strawberry and cashews. <--Try this. You will be happy you did. As you can see, I crumbled Vita Brownies on top for extra sweetness. I always try and make sure that every meal or snack we consume has a good amount of protein--be it through carnivorous or vegan ways. This essential nutrient keeps hunger at bay while helping us to recover faster from a workout, as opposed to eating only carbs or something like that. For someone who's always the oddball when it comes to eating, you have to see from my perspective that I'm happy that he loves it too. I think this is very much note-worthy! PS: Don't forget to check out the salad spinner giveaway! Do you eat a good amount of protein? And in what form? Have you tried Vitalicious before? Do you tend to fall into food ruts or change/mix it up?